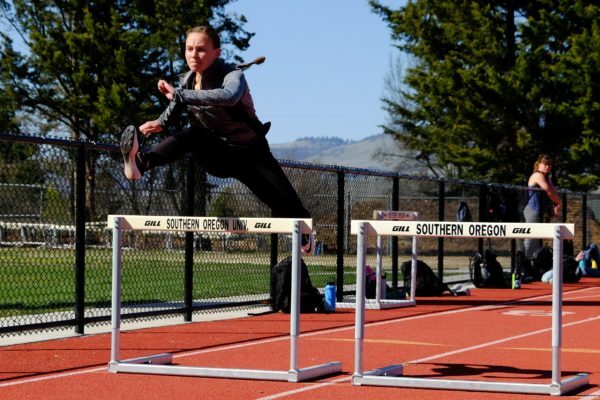 The SOU track and field season is more than halfway completed and the team is going the distance, according to head coach Grier Gatlin. He said both men and women’s team both have great depth in sprints and distances, and that encourages his idea that this season will continue to play out well. However, the men and women’s teams differ in ages. The men’s team is heavy in seniors and will see a lot of graduates after this year, but the women’s team has a lot of freshmen and sophomores. Notable players this season include Jessa Perkinson, senior, in distance from Roseburg, Oregon and Zach Beltz, junior, in long-jumping from Elmira, Oregon. Perkinson is a 12-time All American title holder and she recently won the San Francisco State Invitational Distance Carnival 10,000 meters race. So far this win has been a major highlight for the team, Gatlin said. Beltz came in fourth last year in the National Championships for long-jumping, and he’s jumping again this year, Gatlin said. Gatlin said the wet and cold weather conditions have to be expected for this time of year, and the team has handled it quite well so far. “We’d really like the women’s team to have a strong end of the season because we haven’t won the conference in, I believe, 15 years, so it’s at least nice to be in contention for that,” Gatlin said. Gatlin said he’s most excited to watch the continual improvement of both teams. He said he considers youth and inexperience to be the biggest obstacle for the women’s team, and complacency for the men’s team. “We’ve won the conference a couple years in a row and I think there’s a tendency to sort of rest on your laurels when you have success and sort of keeping that edge is an obstacle that you constantly have to be aware of,” Gatlin said. The meet at U.C. Davis April 14 is an important match-up to watch, Gatlin said. Also, the home meet April 20 and 21, and the meet at Oregon State the last weekend of April will all be important in determining the end of the season. The April 20-21 meet is the only home meet this season. There’s a decent number of prospective team members for the upcoming year, estimated to increase the teams’ success for the following season.